[LONDON: December 2017] Royal Wharf, a new neighbourhood in one of London’s most exciting new areas has just completed its 1000th home, having welcomed its first residents earlier this year. A further 200 units are due to complete early in the new year and all 3,385 new homes on the development are now underconstruction or complete, making the pace and scale of development on this scheme unprecedented for London. Royal Wharf covers 40 acres of riverside land and includes a 2.4 acre park and 500m riverfront promenade, half of which is now open to the public. There are homes to suit everyone with suites, one, two and three bedroom apartments as well as three and four bedroom townhouses. The homes command spectacular views over the river Thames, O2 and Canary Wharf and have been inspired by the traditional Georgian architecture of Belgravia and Fitzrovia, in keeping with the classic character of London yet contemporary in style. The developers, Oxley and Ballymore, have made full use of the industrial materials reflected in the surrounding docklands, all in all creating a rich variety of architectural styles that will stand the test of time. Royal Wharf will create an entirely new community, with a network of interconnecting streets leading onto town squares and gardens, including Sovereign Place – the development’s traditional market square - and Marylebone style high street. Sovereign Place and the high street will provide over 60 independent cafes, shops, restaurants and bars for residents and locals alike. A 3,900 sqft Sainsbury’s and Starbucks store, positioned at the heart of this retail offering, have both opened in 2017 and are now serving the needs of the new community. Further commercial operators will be opening in the new year. 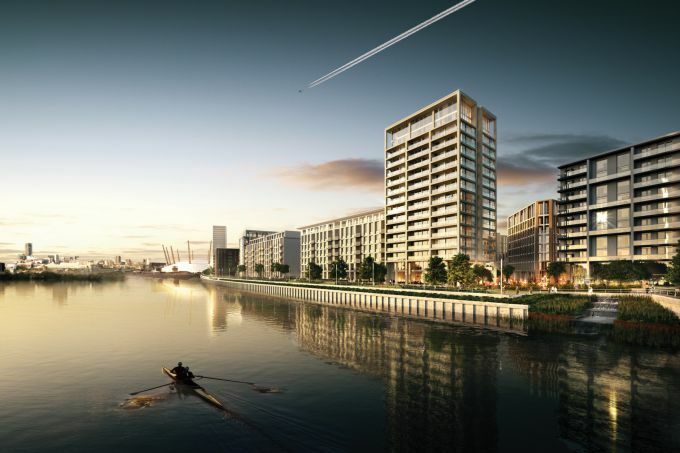 Located on the riverfront, Royal Wharf is naturally inspired by the energy of the River Thames and the area’s maritime heritage. Residents will be able to step out of their apartments onto the new riverfront promenade which leads to the two riverside parks which border the development, Barrier Park and Lyle Park. Scattered around the development are many secluded pocket parks, garden squares and tree lined avenues, with almost half the acreage devoted to green open spaces, Royal Wharf generates a real sense of natural openness, a green haven in a bustling city. Moments from Canary Wharf and situated in the regeneration area of London’s Royal Docks, Royal Wharf has outstanding transport links to central London. Travelling from Pontoon Dock or West Silvertown on the DLR, and Canning Town on the Jubilee Line, will enable residents to reach the West End in 20 minutes, Canary Wharf in five minutes and London City Airport in two minutes. In 2018 a new Crossrail station at Custom House will mean that residents can reach Heathrow Airport in just 41 minutes and the West End in 15 minutes. In addition, the Emirates Air Line, London’s only cross-river cable car, is a short walk away.